Congress and the Peoples Democratic Party are neck to neck in the Presidential and national assembly Elections in Edo State, home of the APC national chairman. Both parties are showing strength in their individual strongholds. Who wins? No official results have been announced as collation of results was still going. 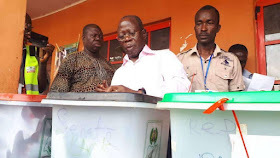 Oshiomhole and the state governor won their polling units clearly, but the PDP made a catch up in several areas. In Edo South where Senator Matthew Urhoghide and Patrick Obahiagbon are in the race, unofficial results showed there were no clear winner yet. For the House of Representatives seat on Ovia Constituency, Dennis Idahosa of the All Progressives Congress maintained a lead in his stronghold while Barr. Omosede Igbinedion held on to Okada, her hometown. Hon Ehiozuwa Agbonnayima took the lead in Ikpoba-Okha while his opponent, Jude Ise-Idehen, is said to win in some wards in Egor. Edo State Commissioner of Police, in charge of elections, Dan-Malam Mohammed, who visited several polling units in company of the lnter-Agencies Consultative Committee on Elections warned policemen not to allow anybody enter INEC office.